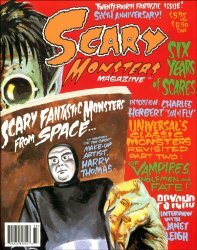 Scary Monsters magazine #24 - 6th Anniversary - Fantastic Monsters from Space! MyMovieMonsters.com > Scary Monsters Magazine > Scary Monsters 1-100 > Scary Monsters magazine #24 - 6th Anniversary - Fantastic Monsters from Space! This is the Twenty Fourth issue of Scary Monsters, published in September 1997. Each copy is new, uncirculated. Interview with Charles Herbert "Son of Fly"
Universal's Classic Monsters Revisited Part Two: Of Vampires, Wolf Men and Fate! Color cover and 194 B&W pulp inside pages.